The Academy Award®-nominated A CAT IN PARIS is a beautifully hand-drawn caper set in the shadow-drenched alleyways of Paris. Dino is a cat that leads a double life. By day he lives with Zoë, a little girl whose mother is a detective in the Parisian police force. But at night Dino sneaks out the window to work with Nico–a slinky cat burglar with a big heart, whose fluid movements are poetry in motion as he evades captors and slips and swishes from rooftop to rooftop across the Paris skyline. 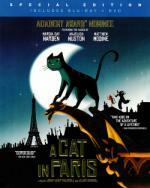 A CAT IN PARIS is a delightful animated adventure perfect for both adults and children–a witty and stylish "animated noir" with a jazzy soundtrack featuring Billie Holiday and a thrilling climax on top of Notre Dame cathedral. What a great little film! It's very much like an old-style heist film, with quite a bit of action, a debonair thief, a dedicated policewoman, and a vicious thug - oh, and a smart, elegant cat. The cat is also perfectly a cat - not a talking cat, just a regular cat. He has some perfectly cat-like expressions and movement too. The part where he looks up at the nanny with one eye open, looking bored, is simply spot-on for a cat. It's hard to say what is so charming about this film - the plot is pretty simple and straightforward, the characters are all well-done but nothing extraordinary, the designs are kind-of Picasso-esque but also very simple, there's a bit of comedy, some chases, some action - but everything comes together in a really delightful way. The hand-drawn art is very simple, stylized, but perfectly effective. It achieves a great middle ground - not hyper-realistic where the art is trying to simulate reality (if you wanted live action, why not film in it?) and not the crude, ugly style that has seemingly come to dominate television animation these days. The film also has great color and makes good use of light and shadow. Art-wise I was most reminded of The Triplets of Bellville, since the people aren't drawn to be extremely pretty, but are more stylized - and yet, more realistic at the same time. Not for the youngest set (the gangsters and gunplay might be a bit much) and not for the "I'm too cool for cartoons" set either (it lacks the requisite wisecracks, sarcasm and hit-you-over-the-head overt pop culture references), but perfectly enjoyable to anyone else. Highly recommended. I agree. I liked this film very much. Hmmmm....I would translate that title as "A Cat's life". Well, yes, of course, that would be the logical thing to do. But that's just not how they work... From my understanding the French take they care here, for randomly changing film titles. The germans are probably not far behind though. Yes we do the same... Just a fast exemple out of my head, here Maximum Overdrive was translate as Les camions maléfiques (The Evil Trucks). Michael Landon's character in Teenage Werewolf may have been desperate (who wouldn't be), but that title omits something rather important, don't you think? And one has to wonder if whoever decided the Swedish title for "Them!" ever actually watched the movie. Probably not, or he would have known that 'they' were ants, not spiders.